The Future's Rosie: What if...? I've been really struggling to find the motivation to write these last few days, 'writers block' I think they call it... a perfectly feasible explanation if I were indeed a writer but I'm not. I'm just a Dad who rambles now and then about his beautiful daughter – nope writers block it isn't. Perhaps I'm feeling the pressure to deliver some sort of perfect and profound post since becoming a MADS finalist? What if she does need that further heart surgery in her twenties? 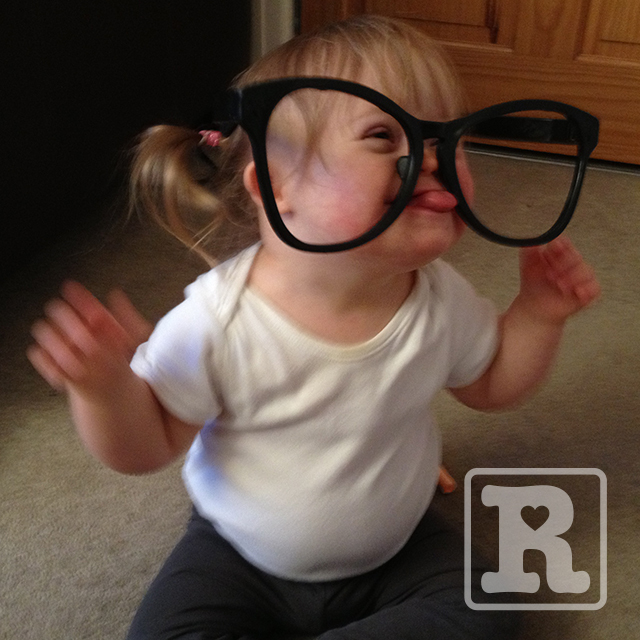 This post doesn't really sit well with the blog title The Futures Rosie does it?! However I've always promised to be open/honest and this is where I am at this particular moment of writing. I hope to look back on that list above one day when Rosie's older and laugh, maybe even feel a bit silly for ever worrying about them at all but for now its something I'm struggling with a little. This is a really honest & moving post - and, as I'm not even a parent, never mind a parent of a DS child, I probably can't offer much constructive comment. But I guess I'd say - you never know what the future will be, you can only think about the most likely "what ifs" and plan for those...and the others? Well, you & your wife will do your best to meet them head on with the same wisdom, courage, love and sheer just-get-on-with-it-edness that you have met all the challenges so far. I think your concerns show just how much you love your three wonderful children: with your support they will rise to meet every challenge, those now, and those when you have gone and they rely on everything you have taugt them. It will be frustratng sometimes (maybe for Rosie more than the others - but maybe not!) but I guess you will teach them well. Quite typical to have a wobble Tom. But none of those things are going to happen to Rosie. If any of them do, you will deal with each one as you come to it, with love and humour as you always do. I love your blog, and Rosie is a gorgeous little girl. You have the same fears for Rosie as you would for any other child; it's just that those fears are magnified for a little one who needs extra help. I'm the sister of a late and wonderful Down's person and I know that my parents had very similar worries which you've expressed. I meant to send you a link to a booklet we produced when my father and I wrote an article for a magazine to which he contributes - we extended it when my sister died. It may help you and I hope that it does. The online booklet needs revision as there are gaps - just scroll to the picture and you're at the end. What if I can't love him enough to be the mother he deserves? By the time we took him home at 5 days old to see how we would 'cope' his grip on our hearts was like a vice. We had the great teacher, right there in our arms. He seemed to know. We were his. What if the effects of my chemotherapy (for breast cancer, when he was 11) scared the living daylights out of him, and he just couldn't understand it? The day he came from school to find I had shaved my head because my hair was falling out in clumps and I'd found some in the fridge (! ), he hugged me and said "never mind darling, the fairies have taken your hair away for now, and they will bring it back" - and they did! What if he persists in wanting to drive and just can't manage it, and has to live with bitter disappointment in himself? And even worse, what if he manages to pass the bloody test and they give him a licence ?? By the time he was old enough to drive he'd learned to catch buses and trains, and realised that driving was really hard. He did get impatient when his younger sister took her time to get her licence - he wanted a personal driver and had her marked for the job. They now have a good deal - she gets to borrow my car as long as she takes him where he needs to go when I need her to give him a lift. He is not above calling on his mobile to request a pick-up. What if he minds having Down syndrome as much as I mind him having it (or more)? As soon as he could articulate it, he said quite clearly, 'it's just me, Mum' and he is one of the most comfortable-in-his-own-skin people I have ever known. So who am I to mind? For a long, long time, 'he is my son, BUT he has Down syndrome' has been 'he is my son AND he has Down syndrome' - I can't pinpoint when that transition occurred, but took time, and I think it was the mind-set that made all the other 'what ifs' melt away. The only 'what if' that troubles me now, and then only occasionally, is the thought of 'what if we hadn't had him? what if we'd missed out?' It doesn't bear thinking about. This might not be your experience, of course, but I hope you find yourself in something like this easy head-space in time. Go easy on yourself - Rosie will. Jill - a good enough mother, to a son I could not imagine not having, just as he is. 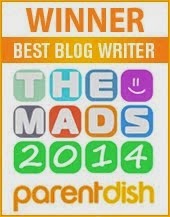 Congratulations on being a finalist on the MADS2013! I worry about those things too...and none of my children are DS. It's perfectly normal and you are a good parent to thinking about those things, because it says you care. You want the best for her and that is GREAT...It becomes a problem when you let your worries and fears hold you hostage and keep you from making decisions. That is the hard part. I suspect you will be just fine and that Rosie will grow and develop when it's her time to grow and develop and you will show the world what loving such a beautiful angel is all about. You will be a wonderful example to all! You ARE a wonderful example to all! I sure appreciate you and all you do and I know your wife and boys do as well! Thank you for sharing you life with all of us! Much love from Utah! Hi Tom, I'm new to your blog... I have a brother who is 6 years old with Down Syndrome. There is 20 years difference between me and him and most people who know us view me as his third parent (a lot of responsibility, which I wonder whether I have unconsciously adopted or whether It has been imposed on me by the role I play within the family already). My mother and father were unaware they were expecting a baby let alone expecting a child with additional needs. My mum was borderline to have any tests done because she was so far gone therefore we decided not to have them carried out because of the risks. If we found out at that stage that something wasn't right we felt would only make us more anxious and consequently harm and affect the baby (of course we didn't ever think that anything would be 'wrong'). We already were debating the 'what if's' and whether we had made the right decision not finding out would this have given us more time to prepare or did we not want the reality of having to deal with the situation if it arose. We found out 3 days after Kieran was born that he had down syndrome, it was so surreal my mother going into hospital to have a baby and coming home without one as Kieran was kept in scbu for 6 weeks. We were given leaflets etc which we still haven't read or looked at, but they remain on the bedside table. My sister and I's response to the news was that 'if anyone picks on him at school we're going to beat them up.' Instantly worrying about the long term future rather than what was going to happen in the coming days/months. I remember my dad apologising to my grandma for not giving her the grandson she deserved. My sister, brother and I were disgusted and angry at his reaction and thought 'how could you say that, he is Kieran.' We certainly had not only Kieran to be protective over but we also found ourselves caring for our parents and helping them to 'grieve' for the baby that they wanted and had expectations for, which at this time all seemed unrealistic expectations. We are still in denial, shock, grief and experience all of the same 'what ifs' questions 6 years on, but not one of those 'what if's' is 'what if things were different, or what if Kieran didn't have down syndrome.' He wouldn't be Kieran and we wouldn't have shared the experiences, met new people, learnt new things if he didn't have down syndrome. Since Kieran was born its made me realise what unconditional love is. I'm currently at University studying a BA Hons degree in Early Childhood Studies, initially wanting to be a teacher, however at the moment I am quite happy plodding along knowing that I am finally doing something I never thought I could achieve. Kieran makes me feel anything is possible. I have attended counselling for the last 3 years and I would describe myself as a complete perfectionist and place very high expectations on everything I do. This can work very positively at times however working in the field of children and families it is difficult working with 'typically' developing children and living a very different life at home (ever heard of the expression doctors are the worse patients, well ignorance would definitely be bliss). Constantly im having to put my 'professional' knowledge which is gained from study and work experience to the back of my mind in order to support Kieran and my parents the best I can, anxiety and fear takes over my everyday life. I am still learning to take each day as it comes (very hard in a society where accountability and progress is forced upon us all the time), I have found this is when I can support Kieran the most effectively and in the right ways. The future is scary regardless if you have a child or not or have a child with additional needs or a "typical" child "uncertainty is our only certainty" But to keep on supporting Rosie the best think about.... 'what if I spend all my time worrying about the future that I forget about the present or even the past." I am so glad that we took video recordings of Kierans own Milestones (not the one's you read about in baby books that appear to be the most important). Even now I feel guilty that we don't take the time often enough to look back at how far not only he has come but how far we have all come and all of those 'what if' questions we had disappear out the window. I went on a down syndrome awareness course when Kieran was almost 3, I listened to the educational psychologist explain that the 'gap' will increase as a child with down syndrome gets older, I convinced myself that she was wrong thinking how can it get much bigger at 3 years old he isn't walking, talking, toileting when all his peers seem to be engaging in conversations getting their message heard, riding their bikes, acting out role play scenarios. We introduced Makaton signing and Kieran has come on with his personality and friendships and now attends Mainstream school. Everyday I drop him off I think to the fears I had about school and the 'playground', feeling guilty that I am abandoning him and if he gets picked on he doesn't have a voice or the ability to walk off to avoid the situation and the impact that has on his confidence. I constantly worry whether the adults that work with him truly understand his condition but most importantly him and do they have the knowledge or experience to support him to develop all of the life skills he will need. Accepting that there is no such thing as 'the good/bad parent, the typical child' is the first step in truly enjoying the life you have. Its hard to sum up in one blog our journey in the last 6 years but I will be happy to speak again. Look back at your what if questions and change them to more positive affirmations or at least ones you have the ability to plan/control? 1 - You cant change other people particularly people you just see in the street but you can choose the way you react to a situation. Be confident in what you know and show off to people the things Rosie can do. People these days claim children are growing up too fast, we're lucky that we get to cherish those special moments longer and at each stage rather than thinking about the next bit they need to move onto. Ironically we would love nothing more than for them to grow up to be independent. 2 - When Rosie learns to walk, how are we going to catch up with her? What places are we going to visit? We were unable to get a mobility car for Kieran until he was 3 which seemed ridiculous because he just started walking as soon as we had access to one. 3 - Rosie may not get invited to every party, but she will have her own parties for her to choose who is special to her and who she wants to invite. I still now judge how many friends ive got by how many cards I receive (setting myself up to fail or what).Children at Kierans school argue for him to choose them as his friends and is one of the first to be invited to others houses. Now try the rest on your own with your family, actually maybe sticking to a few will make them more realistic. Thanks so much. As always your words offer great support. Really looking forward to meeting up again soon. My comments will echo some of the others in that we have What If's for all of our kids. Doing drugs, staying out past curfew, breaking the law, these big issues are not on my worry list for Dev. Your other kids will be kinder, more accepting people too, I bet you already are as well. Dev will be a productive, happy part of society, as we hope/work to make sure all of our kids will be. Are there jerks in school/life? YES. I grew up with them, I would bet you did too, but you did not become a jerk, and your kids won't either. 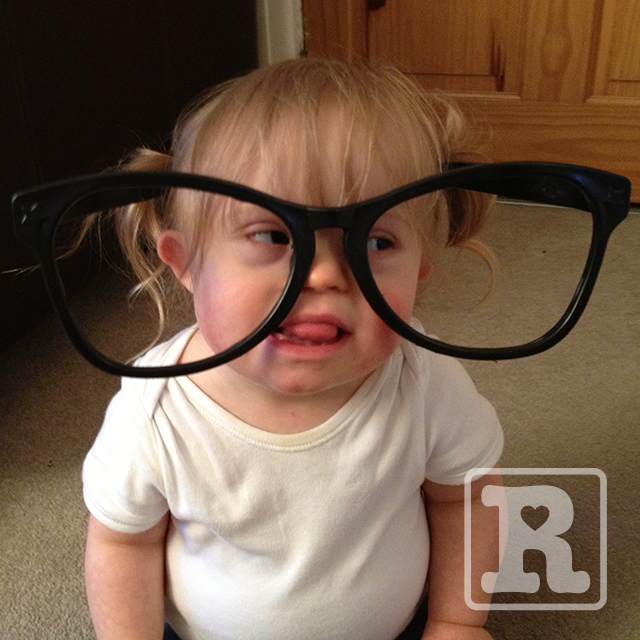 Rosie's future is wonderfully bright, maybe not easy (none really are), but bright! Some very true words in there Sue thank you so much for your thoughts they mean a lot. Just read your 'What If...' and the wonderful comments. I don't know what it's like to have a little girl with Downs but I've been a Paediatric nurse and worked as a Learning support in school and I'm a mum of three 'Grown up ' children. I can relate to some of your 'What ifs' and the 'wobbly times' that come with parenting. What I do know is that I really enjoy reading your wonderful inspiring and beautifully written Blog and love the pictures of Rosie, especially her 'Friday' set everyone up in a great mood for the weekend ones! I voted for your blog of course! My vote wasn't because it gives such a great and positive insight into Down's Syndrome(which it does of course) or because the lovely pictures of Rosie who is just gorgous always make me smile( which they do!). My vote was because your Blogshares the ups and downs and the 'What ifs' of a life completely surrounded and held in the love of a family. We don't get to read enough , or see enough about that in today's world. Rosie is a beautiful little girl really cute and that's the way she 'looks' but its her eyes and her gorgeous smile that always makes me smile and I 'm guessing many others too. The look in her eyes and her smile are there because of the love and support of a wonderful family and there's no way they would be there otherwise. Your Blog is a great flagship for what's important, you write about it and the pictures of Rosie show it. 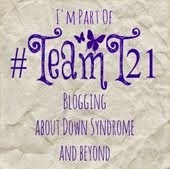 Good luck with the competition..you really deserve to win, but I think your Blog's a winner anyway. I think Rosie is so lucky that you love her so much, and you're so lucky you have her to love and teach you so much more about life than you could ever have hoped to learn without her. I do the 'what ifs' all too often myself. I've been seriously considering homeschool for Gemma, and not just because I want to shelter her from the hurtful comments of other kids, but because I also want to make sure she gets educated to her full potential. I always have to stop myself and remember that it's okay to think about tomorrow...but don't waste too much of today...it won't come around again. Very wise words indeed: "but don't waste too much of today...it won't come around again." Although it's never nice to hear that someone else is having few "wobbly" days as you put it, it is strangely comforting to know that you are not the only one who from time to time experiences these "wobbles". The comments from others tell us what we already know, that our worries are unnecessary, but from time to time we need to voice them. Thank you so much for your honesty and all you do. Been following your blog for a while, and hadn't realised until I saw the article in the Wilmslow Express that you were local. Looking forward to reading some more when the wobbles have passed. Thank you for sharing your thoughts...my heart aches for you and I think Rosie is blessed to have a father like you who loves her so much and like any parent wants the very best out of life for their child. Not sure if you have God in your life but He tells us to never fear as fear comes from a bad place. Always trust and believe that you and your precious Rosie will come first in line with God's protection. Love The Hendriks Family. Your comment "currently I can't bear the thought of someone being horrible to my little angel after she's courageously dealt with so much" echos so true with me as well, thats exactly how I feel about Rosie, she is my hero. Good luck with everything and continue to enjoy your bundle of joy. 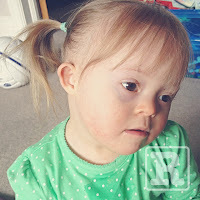 Hi I'm so glad to find this blog, have been reading it with tears in my eyes, Rosie is such a pretty little girl you must be so proud. Beautiful girl, great blog and pictures.